The introduction of Satoshi’s whitepaper mentions “small, casual transactions,” which in legend has transformed into the proverbial cup of coffee. 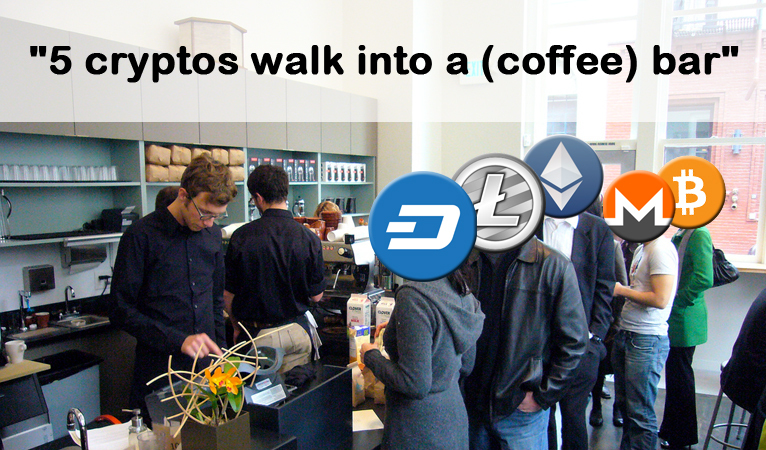 If digital currency is ever to be used as a digital replacement to cash, it has to pass the basic “coffee shop challenge”: how quickly, cheaply, and efficiently can you pay for your morning coffee. Now remember, this is a test of how each coin does in this particular situation, so don’t get your crypto knickers in a bunch if your favorite cryptocurrency is trying to be something other than digital cash. Ease of use Very simple. As the longest-serving cryptocurrency, Bitcoin has a well-developed ecosystem and plenty of dedicated, easy to use wallets to choose from. 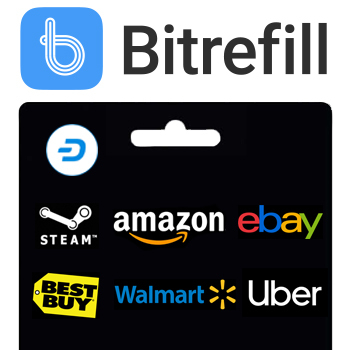 Simply pull out your pin-protected AirBitz or Blockchain.info wallet, scan the QR code, and send. Speed Here’s where we run into problems. 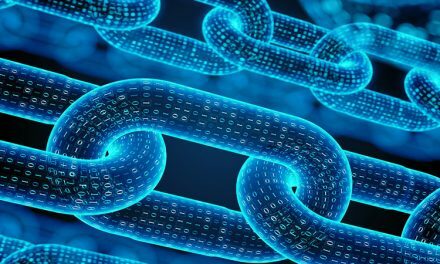 On a theoretical perfect day with literally zero transactions on the network, you might have to wait up to 10 minutes for a single confirmation on the network. Right now, you have to join the line behind 22,000 unconfirmed transactions. You could be there all day waiting for a single confirmation. Trust me, I’ve been there. Fee There’s no getting around it: for these types of purchases, Bitcoin’s fees are absurdly high. The average fee is $4.47 right now, but being optimistic we can look at the most common fee used: $2.36. That’s more than most cups of coffee cost. Hey, it’s a buy-two-get-one deal! At least if you splurged on a fancy latte, the fee might’ve only been half the price. You’d have to spend that fee on almost $100 in order to be competitive with a card reader, and you’d still be waiting a while. That’s some serious coffee party! Ease of use Not quite as polished as Bitcoin, especially since prominent use cases are for things other than simple wallet transactions. Still, plenty of easy multi-coin wallets are out there, but that means you’ll have to do a quick switch to your token of choice before going to pay. Extra 2-3 seconds, nothing much. Speed Varies wildly. At present, you could pay a cheap fee and wait a few minutes, or pay a whole lot more and get that down to around a minute. Good luck getting anything faster than a minute though. And, if you time your morning coffee run poorly, you could land right in the middle of a big ICO where the whole network is entirely unusable. Hope you brought some spare cash just in case! Fee Ethereum is starting to get expensive. The average fee is now $1.13. By far the most typically-used fee is $0.36, so you’re paying more than for a card reader and waiting around a minute or two. Assuming you dodge all ICOs. Ease of use Pretty similar to Ethereum. A quick look at the Google Play store shows no real dedicated Litecoin wallets. Instead you’ll have to go for the multi-coin route, which is pretty easy but adds a couple seconds. Speed Litecoin’s network is pretty fast and not very congested right now. If you’re lucky you’ll only have to wait at most 2.5 minutes for a confirmation. That’s not too long if you’re the only customer in the store, but if there’s a line you might be seriously annoying the rest of the store. Why not duck into the bathroom real quick, when you get out you can look at the barista to give you the thumbs up before going on your way. Fee Average fee is not bad, about 20 cents, less than a bunch of card readers. The most common fee is 2 cents though, which is probably what you’ll be using. Now that’s cheap! Might make hanging around the couple extra minutes waiting for a confirmation worth it. Ease of use Pretty high. 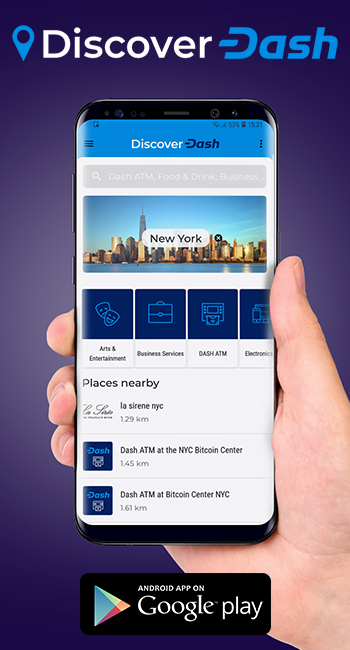 If you’re an Android user, you can use the Dash wallet by Hash Engineering and be ready to go almost instantly. If you’re an iPhone user (poor you), you’ll have to go the multi-coin route and use Jaxx. Not quite as easy as Bitcoin but still better than the rest of the pack. Speed If you’re feeling exceptionally cheap, you can go the standard transaction route and wait a couple minutes for a confirmation. But if the coffee shop line is long and you see a bunch of under-caffeinated workers eyeing you like a pack of hungry wolves, use InstantSend and have your transaction confirm instantly. Entire paying process, including opening your app, around 10 seconds. That won’t upset anyone behind you! 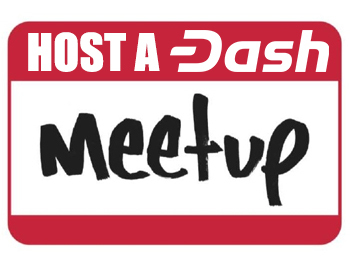 Fee The average fee for Dash is the cheapest of the group at about 17 cents, but if you want to be extra cheap you can get away with the more common 2-cent fee. Even if you go the InstantSend route, that’s still under 20 cents, and you get to walk away right then and there. Now that’s a coffee-buying experience everyone would want! Ease of use Not gonna lie, this is a rough one. No good mobile wallets exist right now, so you’re going to be stuck hauling your laptop to the counter. Either that, or you need to open your web browser and then your web wallet, and login from there. Better hope you’re the only one in the store, and that no one steals your login credentials! Speed You might be waiting a bit. 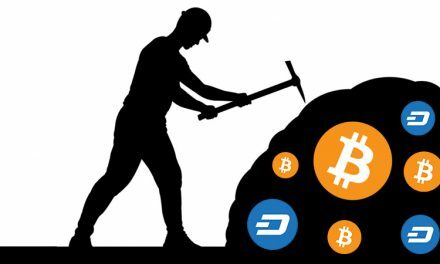 Monero’s transactions are exponentially larger than those of most other coins, so despite the relative light usage of the network, there’s still a backlog. Join the line, you might be there a few minutes. Fee Average fee is about $1.24 right now. Ouch. That’s past Ethereum and close into Bitcoin territory. Hope you’re buying coffee for some coworkers too. There you have it. When you’re buying your morning coffee and want to have the best possible experience with a line of busy and bleary-eyed morning caffeine addicts, which coin will you choose? 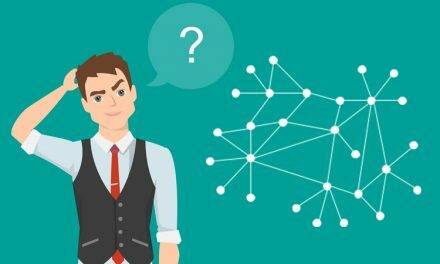 Decentralization: What Is It, Why Does It Matter, Can It Be Proven?